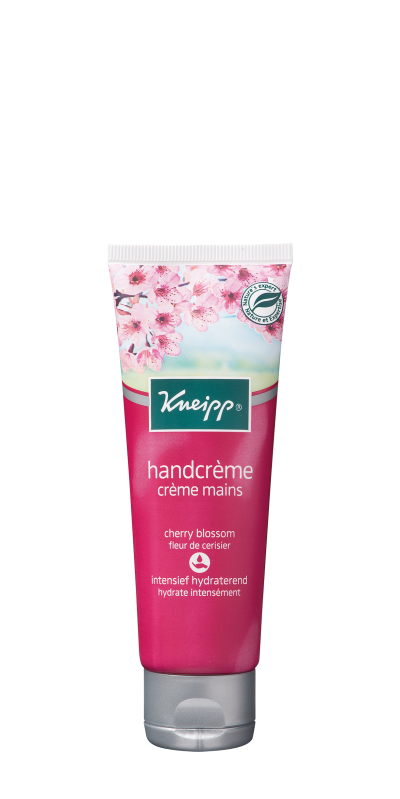 De verzorgende plantaardige formule van de Kneipp® Cherry Blossom Handcrème, met waardevol kersenbloesemextract, hydrateert de handen intensief. Aqua (Water), Glycerin, Prunus Amygdalus Dulcis (Sweet Almond) Oil, Isopropyl Myristate, Cetearyl Alcohol, Tocopheryl Acetate, Distarch Phosphate, Glyceryl Stearate Citrate, Caprylic/Capric Triglyceride, Panthenol, Prunus Serrulata Flower Extract, Citrus Limon (Lemon) Peel Oil, Hexyl Cinnamal, Benzyl Alcohol, Linalool, Limonene, Benzyl Salicylate, Citronellol, Geraniol, p-Anisic Acid, Parfum (Fragrance), Helianthus Annuus (Sunflower) Seed Wax, Caprylyl Glycol, Xanthan Gum, Glyceryl Caprylate, Carrageenan, Arginine, Helianthus Annuus Hybrid Oil, Glycine Soja (Soybean) Oil, Ascorbyl Palmitate, Tocopherol. Voor de handen. Alle huidtypen.